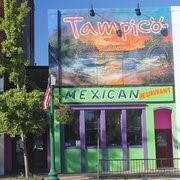 ﻿ Tampico Mexican Restaurant - Ohio. Find It Here. It all began when Luis and Mayra Salas opened their first restaurant, Tampico Mexican Restaurant in Marietta Ohio. That day, they established their commitment to quality ingredients served with a warm and friendly touch  a commitment that continues today.Here at Tampico, we have established a place for you and your family to enjoy fresh, Mexican cuisine created with only the finest ingredients. By using farm-grown, local products, we keep everything fresh. This helps us to focus on our dishes developed from family recipes. When you choose to dine at a Tampico Mexican Restaurant, you will be choosing to enjoy the best Mexican food in Ohio.